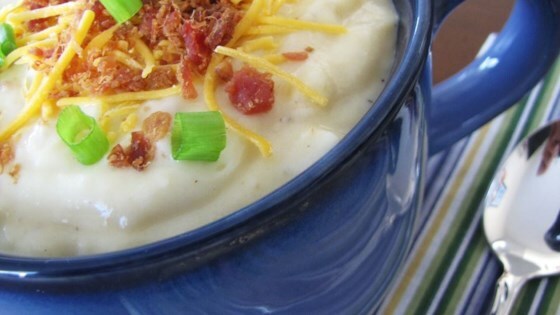 "The last recipe you'll ever have to get for Baked Potato Soup. It's thick soup and could be served with just a salad. Everyone in the family will love this one." Prick potatoes with a fork and cook in the microwave, 3 or 4 at a time, and scoop out the flesh (while the others are cooking). In a large saucepan over medium heat, melt butter. Stir in flour and cook about a minute. Whisk in milk, a little at a time, stirring constantly until thickened. Stir in potatoes, salt, pepper, 1/3 cup bacon bits, 2 tablespoons green onions and most of the cheese. Cook until thoroughly heated. Stir in sour cream and heat through. Serve topped with remaining bacon, onions and cheese. This recipe turned out way too thick. I added extra milk but think that if I make this one again I will try chicken broth. The extra milk made it to rich. This recipe was super easy and tasted great! I modified it a little by using skim milk and fat free sour cream, but it still tasted rich and creamy.